Harry Arter says sealing promotion to the Premier League at the club that released him as a teenager will be a "fairytale ending" to the season. Midfielder Arter returns to Charlton with Bournemouth on Saturday. He signed for the Cherries in 2010 and has been a key member of the side that stands on the brink of the top flight. "I've got strong links with that club. It's nice to go back to where you start and go back on a high," the 25-year-old told BBC Radio Solent. "I'm not bitter towards the fans there, in a way the people who taught me still in the academy will probably look on on Saturday with a bit of pride." Promotion was all but sealed after Monday's 3-0 victory over Bolton at Goldsands Stadium. Only defeat, a Middlesbrough win and a highly unlikely 20-goal swing on the final day of the season could deny them - and even then, they would have a second chance via the play-offs. 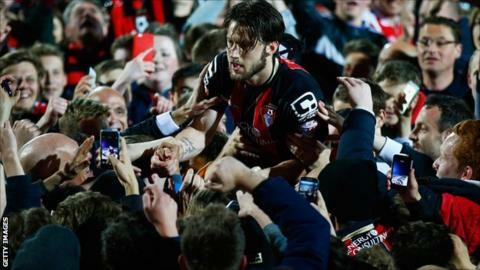 Arter, who was 19 when he was released by Charlton in 2009, said it has been a memorable week for the club. "These weeks are very rare in your life and even more so in football," he continued. "The fact we've been able to celebrate two promotions in three years is unbelievable. When we got promoted from League One that felt like the best feeling in the world. "That feeling got beaten on Monday. It's something I probably won't feel again in football. It's a week and a moment I want to savour." The Cherries go into the final round of games only one point behind leaders Watford. And Arter, who was voted supporters' player of the year, although he thinks midfield partner Andrew Surman deserved the award, said the squad are determined to finish the season with the title. "We want to win the league," he added. "Ultimately the prize is the same, but if you go up as champions it will be that extra special feeling."